Louisville, Ky.-based Kindred Health-care is selling its 91 skilled-nursing facilities and exiting that slow-growth business for a new strategy that will rely on preferred partnerships with other nursing home operators to ensure a smooth patient handoff. The first of those partners was announced last week. Nursing home giant Genesis HealthCare has entered into “strategic clinical collaboration” with Kindred to improve quality, outcomes and patient transitions between the two systems, Kindred and Genesis announced. Details of the partnership are unknown. But Genesis, with its 500 skilled-nursing facilities in 34 states, operates in many markets where Kindred operates post-acute facilities in the faster-growing segments of home and hospice care, rehabilitation services and long-term acute care. In announcing the deal, Genesis CEO George Hager Jr. said that close coordination between the two post-acute giants was crucial in an era of value-based purchasing. 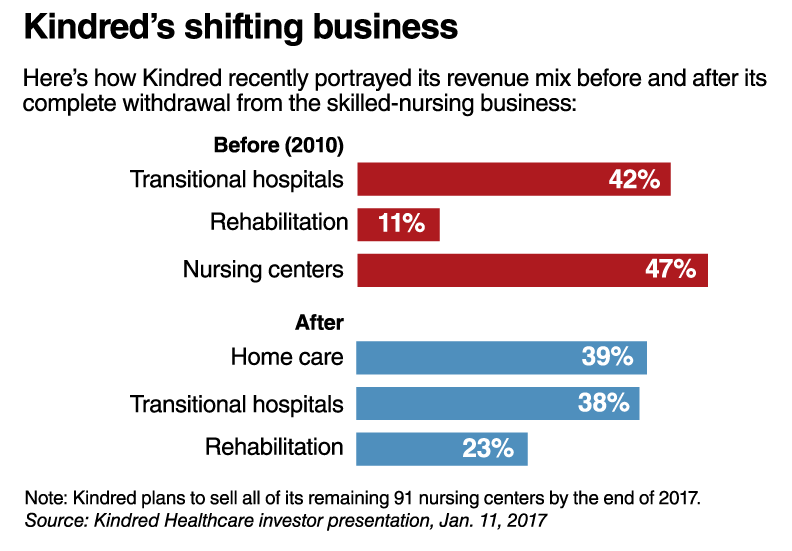 With value-based payment models driving shorter nursing facility stays, Kindred is dumping its skilled-nursing assets in favor of a "virtual portfolio" of preferred skilled-nursing providers. At the J.P. Morgan Healthcare Conference in San Francisco last month, Kindred CEO Benjamin Breier said Kindred could replace the 91 nursing homes it is selling with a “virtual portfolio” of facilities owned by preferred partners when it needed to hand off patients. Kindred announced in November that it was selling all of its nursing homes in the face of census declines, patient-mix deterioration and higher labor costs. It is Kindred's smallest and least profitable segment, posting a third-quarter decline in EBITDA of 16.7% to $29.9 million on revenue of $270.3 million. To improve that performance, Kindred was going to have to “double down” to build the number of skilled-nursing facilities it needed in local markets to get good market penetration, Breier said. Or it could find partners already there and put a premium on coordinating care with them. So Kindred decided to go the latter route, with the Genesis deal being the first stop on that journey. “We're creating these virtual networks to have nursing centers be a part of our portfolio but not having to actually own them,” Breier told the analysts last month. Breier said efficient post-acute care is becoming increasingly vital as payers ask providers to take on the risk of managing patient populations. As it stands today, nearly half of all Medicare patients leaving a hospital require post-acute care. And the Institute of Medicine, Breier said, has found that 73% of all variation in Medicare spending happens in post-acute care. Coordinating care with other providers offers a way to drive down that variation and its associated costs, he said. Of equal importance, Kindred expects to eliminate $90 million it is paying in rent every year and save another $30 million it is spending annually to improve the facilities. Breier said Kindred expects to sell all the nursing homes by year-end.